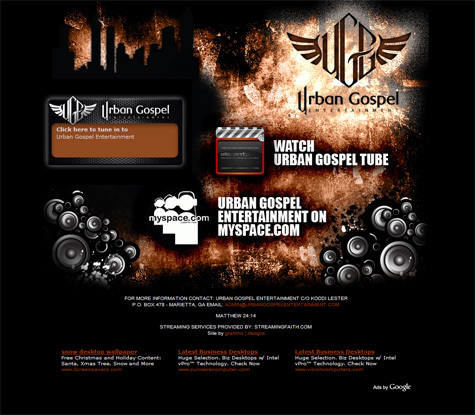 My good friend and ex-coworker, Koddi, wanted me to do a little page for her Urban Gospel network piece she recently started, so I said, “Cool.” I had created a page for her before, but she had me use some sort of crazy Yahoo Site Builder thing, which I was about to throw out the door. In all honesty, my long time friend and co-worker, Sean created her media player, and I stole some of the graphics off of it, rearranged it, Photoshop-ed it and sliced it. Added a little web site tweaking here and there, and Viola! A neat little one page site…done in about an hour. LOL.